This is a selection of stories of ordinary people's faith experiences, bringing out what people mean when they say they have met Jesus. The author sets out to understand, by exploring the lives of a variety of individuals and by personal reflection, why some people believe they experience Jesus and others do not. ;Clare Nonhebel's how n story - childhood faith in the face of abuse, and then serious illness in adulthood - is recollected as she talks to, among others, a young man dying of a wasting disease, a woman who ended a long-term relationship and has remained single ever since, a retired consultant who introduced hospice care for the terminally ill to the NHS, a man who believes Christian faith is a moral code, and an Indian girl who was inspired to leave her comfortable home in Bombay to work with the poor. ;But are doubt and searching an essential part of the search for God or temptations to be overcome? Do we all have to have the same experience of God? What if our beliefs and our experiences are in conflict? The book engages with those who struggle to come to terms with Christian belief, or who, believing, struggle with doubt. 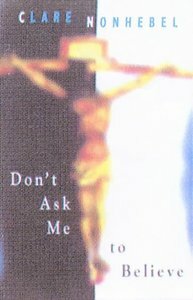 About "Don't Ask Me to Believe"